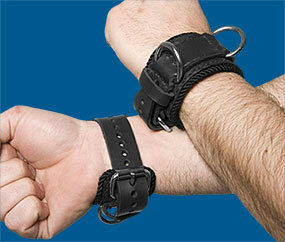 Description If hangin' from the ceiling is your thing, these leather cuffs are for you. These are incredibly high-quality leather wrist restraint cuffs which are handmade locally just for us from 100% thick black leather. These cuffs have double-layered, hand-stitched and reinforced leather holding on two large metal D-rings and an adjustable buckled strap. The inside of the cuff has soft velvet lining, and the entire cuff has braided edges. 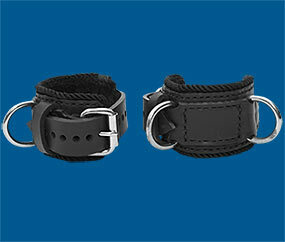 The buckled strap adjusts to fit wrists up to 9" around. THESE CUFFS ARE SOLD AS A PAIR. If you only want one, please contact us through the contact form for a special order. These are the highest-quality leather pieces we sell and they're made to last as long as you do! We also offer similar ankle restraint cuffs and collars for a matching set.